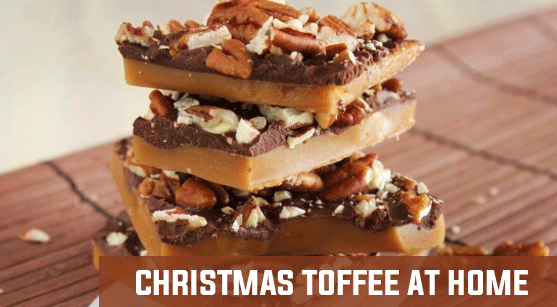 Certain gifts during Christmas have been a traditional since years and keeping that alive, we here tell you how you can make toffees at home. These simple toffees do not take much time. Homemade gifts always add to the special element. And whilst making your hamper basket, toffees should be added with ginger beard cookies and other chocolates. So, if you are a fan of baking or like cooking, then let us begin with creating almond and chocolate Christmas toffees. And lastly, half a cup of chopped almonds. The approx. time to make, cool and prepare this toffee is 2 hours. Firstly, grease the pan with little butter and keep it aside. Now, in a saucepan melt the remaining butter. Gradually add sugar, slivered almonds, salt and then water. Keep stirring this mix on medium speed. If you have a candy thermometer then let it heat until it reads 295 degrees. If not then wait for a little boil to come. Remove it from heat and add the vanilla essence or extract and stir well. Now pour this mix into the greased pan. Spread evenly on the pan and leave it at room temperature for about an hour. After this, take a microwave safe container and melt a cup of chocolate chips. Spread this over the toffee which is cooling in the pan. Let it refrigerate for 50 minutes until it sets and cools well. Invert the toffee onto a large baking sheet and melt the remaining chips. Now spread this liquid chocolate over the toffee. Sprinkle the finely chopped almonds on top of the chocolate spread and leave it for about an hour at room temperature. Break the pieces in any shape you like and put the toffee in an airtight container. You can store it in the fridge for a while before you put it in a fancy jar for gifting. It will settle the almonds and chocolate well. It is best to prepare this a night before gifting. Also, if you are a baking maniac and love cooking these items, then you should own a candy thermometer. This will help you know the appropriate and right temperature. Sometimes, you could go wrong with your judgement. It is better to rely on the thermometer. Well, this was it for the Christmas toffees. Isn’t it super easy? You just need some time and all the ingredients to make it. You do not even need baking skills for this. So when you are including Christmas chocolate gifts in your hamper basket, put some toffees as an additional and special item.